This was a pretty good, if atypical, Holocaust story. The author and his family lived in relative comfort throughout the war, thanks in large part to his resourcefulness and sheer brazenness. He obtained false papers for himself, his wife, their children, and various members of their extended family. For much of the war he had a nice job administering a Polish nobleman's estate. But he and his loved ones were never far from danger, and he knew it. They had many close calls and had to rely on the kindness and discretion of a lot of gentiles to survive. However, in the end, everyone who agreed to go along with Shatyn's plan survived the war, except his mother who died of natural causes.The primary fault in the memoir is that it begins too slowly. Shatyn spends, in my opinion, way too much time going into his background and his prewar education and legal career. 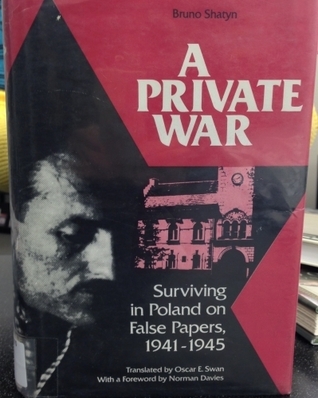 The Nazis don't invade Poland until around page 120.